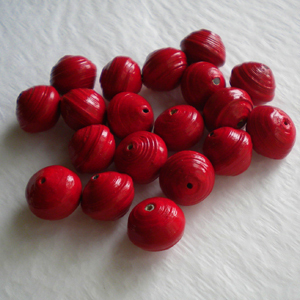 You paint big round beads in red acrylic paint, that look like red delicious and you have a bright happy beads that you can use any way you want. 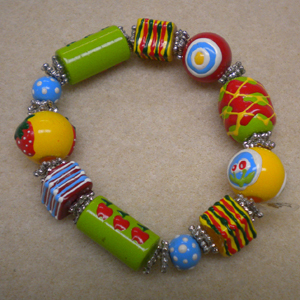 I found this bracelet that just makes me smile and I think would make a great teacher’s gift. I wanted to make it into a necklace but does not have enough beads, so I painted big round beads with red, applied Vibrance over it and this is how they came out. 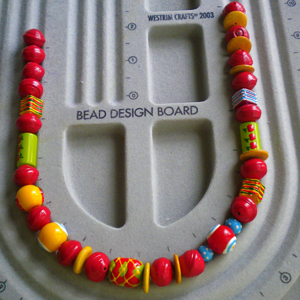 When you are trying to come up with a design and play around with it, it always helps to have a bead board, you can also determine the length of the necklace this way. I added some flat discs as fillers, if you have buttons instead, you can use that too. And now you have, a fun, happy necklace! 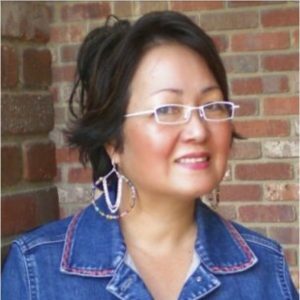 Kathy, Thanks for the advice. I’ll give it a try. I love this one !! 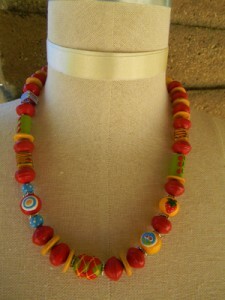 in fact, it’s my favourite painted beads necklace !! and I too have made round beads from light cardboard, it’s the easiest way i found. 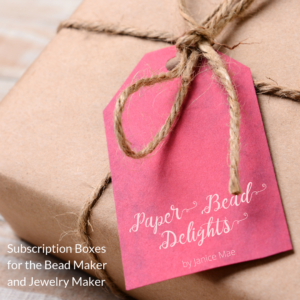 Linda, I make big round beads using light weight cardboard, using boxes from snack cakes. I raid the recycle bin here at work! They are white on the inside so easy to paint and they roll fairly easily using a metal cotter pin because the cardboard is thin. I usually cut the triangle base about 1/2 inch and the box, after flattening is anywhere from 14-18 inches long. Hope this helps! I love your big round beads. I have tried and tried to make some but I can’t get it right. I’ve gotten pretty frustrated so I gave up. I’ll just have to admire yours. oh, that’s funny! it’s exactly in the same spirit that I painted my paper beads ! I must still varnishing them…. for my project, i don’t have yet bead board for design but perhaps i’ll be try just make it one myself this time ? that’s an idea ! 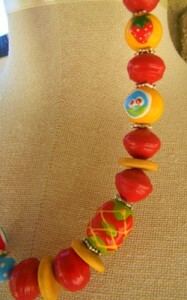 i love the painted big round beads!! This is the cutest. I love the bright colors, it reminds me of summer with popsicles and Watermelons. Nice!